How many servings of dark leafy greens do you get into your diet on a daily basis? If you find yourself consistently falling short, try adding them to your smoothie for a quick and easy, no-fuss was to get more of these health-promoting superfoods into your diet. 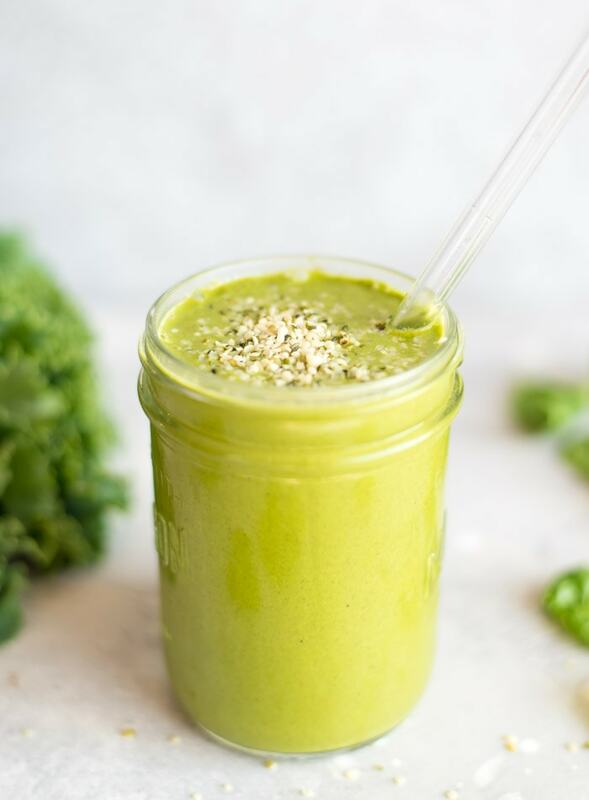 This Kale Spinach Smoothie tastes amazing, is loaded with nutrition, high in protein, thick and creamy and completely vegan. 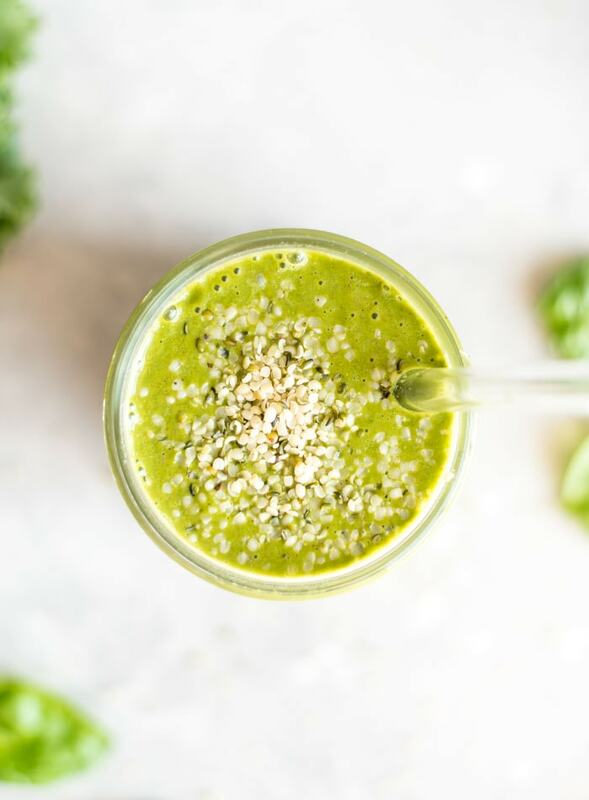 It’s made with frozen banana, almond milk, dates, cinnamon, vegan vanilla protein powder, spinach and kale for a filling and nutrient-rich smoothie perfect for breakfast or a snack. Frozen banana. Frozen banana is key for sweet and creamy smoothies. I’d recommend keeping your freezer stocked with frozen banana so you’re always ready for a delicous smoothie. This is a great way to use up overripe bananas that you’re not going to get around to eating too, or feel free to buy those spotty bananas that no one else wants…they’re perfect for smoothies! Dates. Dates add a hint of caramel flavour to smoothies you just can’t beat. Especially when you’re adding lots of greens and want your smoothie on the sweeter side to mask the flavour. I used sayer dates in this recipe. They have a rich, sweet, decadent, caramel flavour that works beautifully in recipes. You can also use honey, medjool dates or deglect noor dates. I used 3 sayer dates but they’re quite small so if you’re using large medjool dates, you might way to reduce that to 2 dates or even 1 if they’re very large. Cinnamon. Cinnamon adds a nice flavour and if you use true, ceylon cinnamon you can take advantage of its’ blood sugar-stabilizing benefits. Almond butter. Almond butter adds creamy almond flavour, healthy fats and minerals to the smoothie. You can substitute any other nut or seed butter or even ground flax or hemp seeds. Peanut butter, cashew butter or sunflower seed butter would be yummy. The added fats also help increase absorption of the fat-soluable vitamins in the rest of the ingredients. Almond milk. I used unsweetened plain almond milk but you can use any non-dairy store-bought or homemade nut or seed milk. Hemp seed milk, cashew milk or coconut milk would be yummy. Coconut water would also work. I like store-bought fortified almond milk for the added calcium, B12 and vitamin D.
This smoothie contains healthy fats from the almond milk, loads of disease-fighting antioxidants from the spinach and kale, it’s high in calcium, vitamin E, magnesium, potassium and contains smaller amounts of a wide range of essential minerals. As far as whole foods go, dark leafy greens offer the most nutrition per calorie than any other food. According to How Not to Die, eating greens nearly everyday may be one of the most powerful stems you can take to prolong your life. In addition, a team of Harvard University researches analyzed all food groups and found that greens turned out to be associated with the strongest protection against major chronic illnesses including up to a 20% reducing in heart attack and stroke for every daily additional serving. So, eat those greens, guys!! 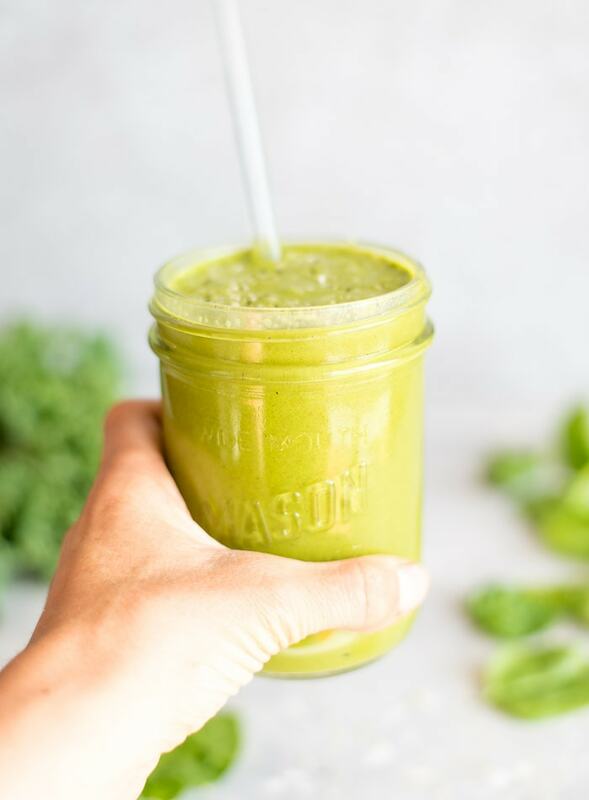 Enjoy this simple but delicious and nutritious kale spinach smoothie for breakfast or a snack anytime you need a natural boost in energy. It’s great for adults but kids will love it too. It’s thick, creamy and just sweet enough that you’ll won’t notice the kale and spinach hiding in it. I love the bright green colour but if you have kids you need to sneak some greens by, try swapping half the frozen banana for 1/2 cup of frozen blueberries. This smoothie contains 435 calories with 13 grams of fats, 58 grams of carbohydrates and 28 grams of protein. 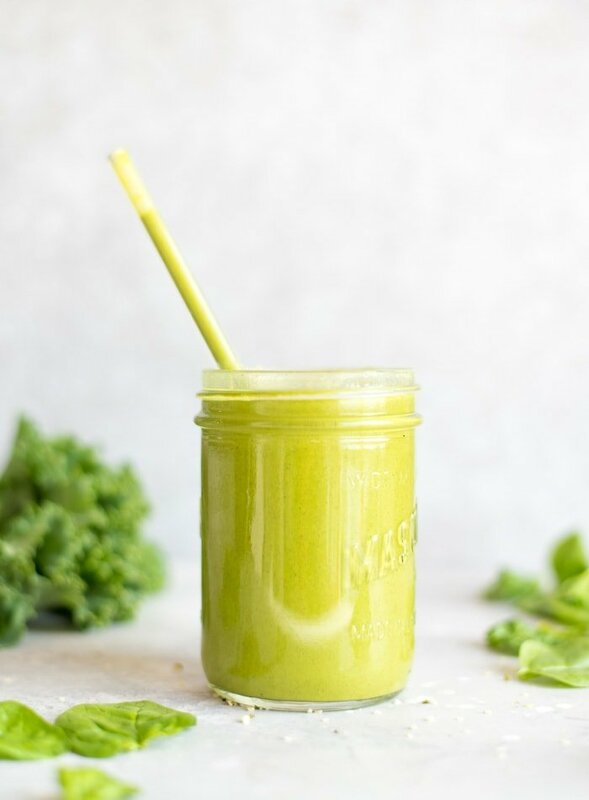 You’ll also be getting 12 grams of dietary fibre, 75% of your daily calcium (if you used store-bought almond milk), 40% of your daily iron and more than your daily vitamin A and vitamin C.
This thick and creamy smoothie is nutrient-packed and an easy way to sneak your daily dark, leafy greens into your diet. With ingredients like frozen banana, cinnamon, almond butter and dates, it’s just sweet enough and the vegan vanilla protein powder boost the protein content to make it a complete meal. Add all of the ingredients to a high-speed blender. Turn it on low then slowly increase the speed to high and blend until it’s completely smooth and creamy. I definitely want to start incorporating more smoothies into my breakfasts and snacks, especially after a workout with the warmer weather! Such an easy way to increase your fruit and veggie intake! Totally, they’re perfect in the warmer months and the best way to up your veggie intake! Hope you enjoy it.